Stems: Ascending to erect, simple or branched, glabrous; not rooting at nodes. Leaves: Alternate; stipules absent; petiole absent; blade oblanceolate to oblong or spatulate, .4 to 2 inches long, .25 to .4 inch wide, base symmetric, subcordate to rounded or attenuate, sometimes clasping, margins finely toothed, tip rounded to obtuse or retuse, surfaces glabrous. Inflorescences: Cyathia, terminal, peduncle .01 to .06 inch. Flowers: Involucres campanulate, 0.2 to 0.6 x 0.3 to 0.5 inch, glabrous; glands 4 to 5, greenish, elliptic to obong or reniform; appendage absent. Staminate flowers 3-10, sepals 0; petals 0; stamen 1. Pistillate flower: ovary glabrous; styles cleft in two parts for 1/2--1/4 their lengths. Fruits: Capsules depressed-globose, 3-lobed, .08 to .14 inch, glabrous, warty near apex and along lobes; seeds reddish brown to dark purple, ovoid to globose, .05 to .09 inch, smooth to reticulate or ridged. Habitat: Rocky or sandy tallgrass and mixed-grass prairies. Distribution: Principally east 2/3 but also scattered occurance in west of Kansas. Comments: For Euphorbus, 1st century Greek physcian. 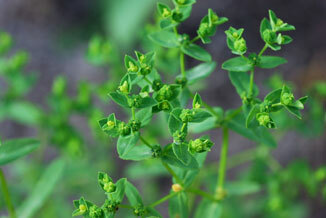 Euphorbia is among the largest genera of flowering plants.